To show how Abraham is not only our example in the faith. It is through him all the teachings and promises of our gospel have their origins in the covenant God made with him. 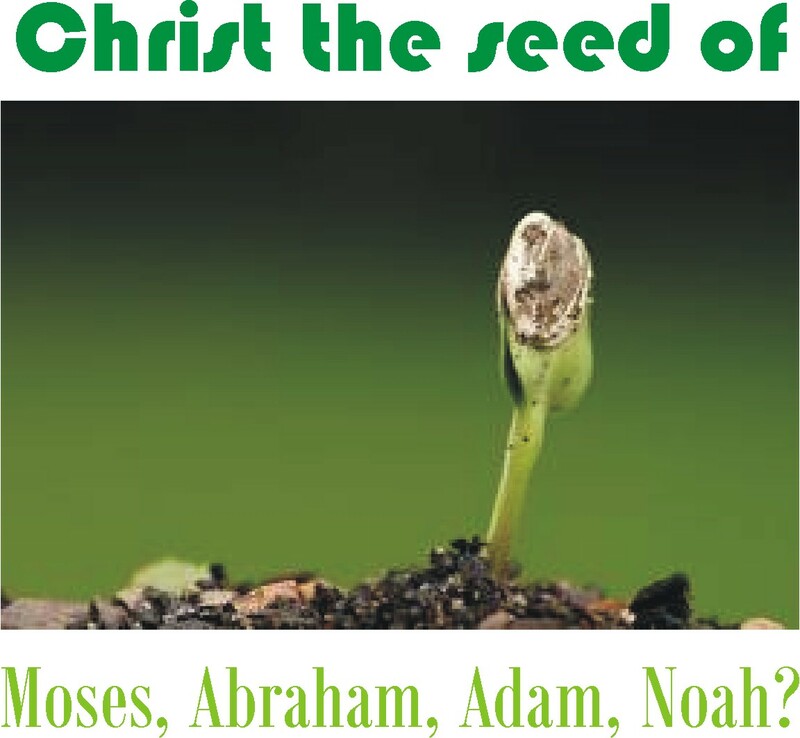 Of whose seed is Jesus? glasseyedave	. Abraham	. Abraham, Arminianism, Bible, born again, doctrine, faith, Grace, holiness, imputed righteousness, Moses, New Testament, Old Testament, promises, repent, rightouseness, Saved, Seed, The Bride, The Bride of Christ, the church, The gospel according to the gospel, The Gospel the church refuses to believe, The hope of salvation, Whose seed is Christ? Here at The Gospel According to the Gospel I admittedly advocate a gospel that is different than what we have preached to us in churches. I believe scripture teaches that we gentiles are grafted into a covenant of righteousness that did not start with Christ, but Abraham. I have written extensively of how we gentiles are now included in this blessing through Christ who has become our minister of circumcision. This sounds so offensive to many, but I have put scripture and verse on these beliefs of mine. I believe that I defend the gospel that Paul was preaching in the last book of Acts towards the end of His life, when He finally made it to Rome. In Rome he preached our New Testament gospel from the Law of Moses and the prophets. I have written how his gospel preached in Rome from the books of Moses is found in his writings. Even the above paragraph is part of this gospel. I have marveled on page how this gospel that Paul preached from the books of Moses has been overlooked and offends us who say we put our hope in the gospel. I have written how Abraham is used as our example of faith, our example of righteousness that comes from faith. He was the one given the covenant with God that we gentiles now share in. How God did not come to make gentiles believers in and of themselves, but believers through the promise and blessing given to Abraham. This is why we are called the children of Abraham who are not the children of Abraham. I could go on about how he is our example of hope in the promises of God. How he did not even receive one square foot of ground from God but he did not wavier in his faith, because he his confidence was not in the fulfilled promise but the one who made the promise, yet to be fulfilled. I believe this directly relates to us in our hope of salvation. This of course sends people over the edge. They can not imagine that in our gospel God speaks things that are not as if they were. They reject the idea that we have faith in the promise of salvation, they instead say we have faith in what we have, even though scripture teaches the opposite. Scripture is clear faith is hope put in what we do not have, what is unseen, unfulfilled but promised by God. It is for this gospel that not only I but my wife has been greatly abused by other believers. I am called dangerous. Because of this belief in what I read in scripture my family has been cut off from other believers. And they do this justifying their positions by letting me know they don’t want to talk about it. At all! So we can not come together as believers to discus God’s word, for apparently I have gotten my information from a source other than scripture. I doubt any believer goes to God more than I do concerning what they believe. I go back and back and back to God asking Him if I have His one true gospel of scripture. If I don’t I plead with Him to give it to me. I with an open heart ask Him to change my understanding of scripture if I believe in something wrong. But if He has me on the right track, I want Him to confirm it to me again. I can not read scriptures without being unsuspectedly jumped by the word of God. What I have given a brief summary of keeps popping off the pages when I read. I can not escape it. It is always there before my eyes. I am reading in the book of Hebrews and I am reading about Jesus and how He is lower than the angels and made perfect through suffering. How all things are subject to Him now but not all things are seen under subjection to Him yet. Reading on I come across a description of Jesus. It says that Jesus is the seed of man? How about the seed of Adam? Maybe it would be a seed of Noah, since all mankind comes from him too? No, it was not to any of these that the writer of Hebrews says Jesus is a seed of. Scripture teaches Jesus did not take on the nature of angles but He took on himself the seed of Abraham. Jesus took on Himself the seed of him to whom the promise was given. He took on Himself the seed of him whom Paul teaches was given a seal of righteousness called circumcision. Jesus took on Himself the seed of him who we gentiles are now the seed of through Christ. Jesus has ministered to us gentiles and the Jew as a minister of circumcision given to Abraham, when He took on the seed of Abraham. And why the seed of Abraham? Abraham and his offspring were given the covenant of righteousness in circumcision and his descendents the Law through Moses. The Law being a shadow of Christ pointed to the day that Christ would be our high priest and make reconciliation for the sins of the people. God was showing through the Law until the time of Christ, how God would fulfill the promise of imputed righteousness in circumcision for the sins of the people. This is why Paul calls Him the minister of circumcision. There is no other people group who has this promise, this covenant from God that Jesus could be the seed of. God wouldn’t want His Son to be the seed of Adam or man because there is no covenant there. This is why our gospel talks so much of Abraham, circumcision and faith in what is hoped in. This gospel will not let me escape its grasp. Even when I time after time after time go before God in serious pray, asking Him to give me the true gospel if I have fallen astray. Those who are so quick to be repulsed by my beliefs and understanding of the gospel, even though I present scripture upon scripture upon scripture to you, did not pray once to ask God to examine you or to give you His one true gospel. But you sure are quick to rebuke me for a gospel that begins with Abraham. Instead of defending what you know, why don’t you go to God with the scripture I present to you concerning what Paul preached from the Law of Moses and the prophets and ask Him if maybe you have not understood scripture. Instead of immediate criticism why don’t you spend time before the Lord? After all, is it not the goal to know the revelation of God through scripture? Or to argue what we know and ignore scripture? I do believe, I do believe, I do believe, I do believe! In order to better state the purpose of The Gospel According to the Gospel I have added a statement of belief page called Uncommon Belief. It is my hope and purpose to help people see the gospel of scripture as taught in our New Testament scriptures. My Book The Gospel According to the Gospel and my postings are dedicated to proving what I have written below. So every time you read one of my postings you will see evidence of one or more of these statements of belief. The New Testament teaches, believers in Jesus Christ are not saved and have a hope of salvation. The New Testament teaches, faith is hoping for what we do not yet have. The New Testament teaches, into this hope we were saved. The New Testament teaches, no one hopes for what he has. The New Testament teaches, believers will be given their salvation when Christ returns. The New Testament teaches, believers need to remain in Christ in order to be saved at His coming. The New Testament teaches, believers waiting for their salvation can turn away from the faith that would have saved them. The New Testament teaches, God speaks things that are not as if they were in our gospel when it says we have been saved. The New Testament teaches, our gospel wasn’t first preached in the book of Matthew. The New Testament teaches, that our gospel we put our hope in for salvation was first preached at Mt. Sinai. The New Testament teaches, believers are credited righteousness. The New Testament teaches, believers will be given righteousness when Christ returns. The New Testament teaches, that our credited righteousness is nothing more than what God credited Abraham. The New Testament teaches, that it wasn’t through the cross that God introduced credited righteousness since this was done through Abraham. The New Testament teaches, that through Christ we share in the credited righteousness that God gave Abraham. The New Testament teaches, that the credited righteousness that was given to Abraham was for him and his descendants. The New Testament teaches, we become Abraham’s descendants when we put our hope in Christ. The New Testament teaches the sign of credited righteousness in the Old Covenant is circumcision. The New Testament teaches the sign of the credited righteousness in the New Covenant is the deposit of the Holy Spirit. The New Testament teaches, we are eternally secure when Christ returns to give us our salvation. The New Testament teaches, that we did not go to plan “B” when Adam sinned. We have been on plan “A” and forever will be on plan “A”. The New Testament teaches, there is a faith found in the Law. The New Testament teaches, those who put their hope in the faith found in the Law were credited the righteousness that God gave Abraham. The New Testament teaches, those who put their hope in the Law of the faith, reject God’s righteousness that comes by faith. I read a post on Henry’s web site called “Do the Jews need Jesus Christ for salvation?” that shows how bad the understanding of our gospel has gotten in large mainstream churches. I commented on his post the following material since my response to his post is at the heart of The Gospel According to the Gospel. Please feel free to read other of Henry’s material. I do not give out such a referral lightly. I read your post and I was taken back by what you had said about this teaching. What stuck out to me was, “the gospel was given to non-Jews only.” For anyone to say or believe this leads me to believe they do not understand their own gospel. Who do these men think had the gospel preached to them? The writers of Hebrews understood the gospel to have already been preached to the Jews at Mt. Sinai. The disciples recognized our gospel from the Law of Moses and the prophets when they saw Jesus. (Luke 24:27 NIV) And beginning with Moses and all the Prophets, he explained to them what was said in all the Scriptures concerning himself. This is not even all the verses in our New Testament that speaks of our gospel, the testimony of Jesus Christ, found in the Law of Moses. How can anyone say, “The gospel was given to non-Jews only?” According to the testimony of our New Testament, the Jews were the first ones to receive our gospel. Even Abraham their and our father had the gospel foretold to him. If we do not think Abraham understood the gospel we have today, if we don’t think he understood through whom we have our hope, listen to Jesus’ testimony of the gospel announced in advance to Abraham. Abraham not only saw Jesus’ day that we now get to look back to and yet look forward too, he had received the benefit of the hope of one who believes the gospel message. (Rom 4:11 NIV) And he received the sign of circumcision, a seal of the righteousness that he had by faith while he was still uncircumcised. So then, he is the father of all who believe but have not been circumcised, in order that righteousness might be credited to them. And now through Christ, we gentiles don’t simply get to have a gospel that “was given to non-Jews only”, instead we get to share in this very Jewish gospel. We get to share in the gospel announced in advance to Abraham, which he saw Jesus, and the righteousness that comes by faith. In fact I would say our gospel is very Jewish and only for Abraham’s descendants. That is why we believers in Christ are now Abraham’s children. If you are not identified as Abraham’s child you do not participate in this very Jewish gospel. (Heb 2:14-16 NIV) Since the children have flesh and blood, he too shared in their humanity so that by his death he might destroy him who holds the power of death–that is, the devil– and free those who all their lives were held in slavery by their fear of death. For surely it is not angels he helps, but Abraham’s descendants. It is so amazing to me how the church has so perverted our gospel and where it is to be found and to whom it was promised. No wonder what is preached in many pulpits regarding our gospel of salvation is not found in scripture. How much more our hope of salvation? It is long past the time we need to get the facts concerning our gospel and understand we have been grafted into a Jewish gospel. What blessings of Abraham do we share in? Paul makes a very interesting statement in the book of Galatians. He says that the purpose of Christ was to qualify us gentiles to receive what was given to Abraham. This goes contrary to our church gospel, since we in church seam to assume that we New Testament believers get all the good stuff because of Christ, while those of the Old Testament were stuck with legalism. However Paul, of whom we say we follow his doctrine, teaches something completely different than what we believe. It isn’t that we as New Testament believers get all the good stuff and those poor saps of the Old Testament get all the inconsequential stuff. We through Christ get to participate in what was a blessing to Abraham. And what was Abraham blessed with? Abraham was blessed with imputed righteousness. His blessing was God crediting him righteousness that he did not deserve. So is his righteousness just like ours or is our righteousness just like his? being fully persuaded that God had power to do what he had promised. This is why “it was credited to him as righteousness.” The words “it was credited to him” were written not for him alone, but also for us, to whom God will credit righteousness–for us who believe in him who raised Jesus our Lord from the dead. We now get to share in this undeserved credited righteousness through Christ. What God gave to Abraham and his descendants was also intended for us through His Son. So it isn’t that the Old Testament saints only had available to them a righteousness through the Law. They had it through faith as their circumcision testified too. I talked more of this in yesterdays post “More proof in the pudding”. So it is not that Abraham’s imputed righteousness is like ours. Instead we get to share in Abraham’s blessing of imputed righteousness through Christ. Now having a righteousness not our own just like our father Abraham and this through Christ, we too get to share in the Holy Spirit, just as Paul said in Galatians. And you also were included in Christ when you heard the word of truth, the gospel of your salvation. Having believed, you were marked in him with a seal, the promised Holy Spirit, who is a deposit guaranteeing our inheritance until the redemption of those who are God’s possession–to the praise of his glory. So let us rejoice in the true gospel of our salvation and reject the gospel that comes from church pulpits, who teach the Old Testament has become null and void. For the truth of the matter is that what is found in the Old Testament is now shared with us through Christ. And this is not the gospel according to man but The Gospel According to the Gospel. Please go to “Abraham” to see more on this blessing given to our father Abraham that we now through Christ share in.